BBCM, Butcher, Baker and Cappucino Maker, is a European-inspired cafe and restaurant that recently opened in West Hollywood to much anticipation. The atmosphere is designed with extreme attention to detail and will inspire as it transports you to a new world. 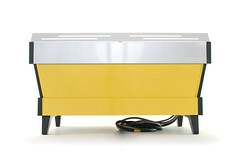 The Espresso Parts Custom Shop was excited to jump on the opportunity with BBCM to further enhance the aesthetics of the space by customizing 5 bright and colorful pieces of equipment specifically for them. A La Marzocco GB5 3AV, Mazzer Robur E, Mazzer Super Jolly E and a Napa Technology WineStation all matching in style and color. 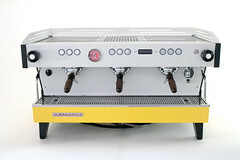 The La Marzocco GB5 3AV was powder coated pastel green and off white with a matte finish. Custom glass panels were mounted on the side and etched with the BBCM logo in brass leaf inlay. The logo was also placed with brass leaf on the body panel in the front. Custom herringbone engraved walnut portafilter handles were laser etched to replace the stock handles. 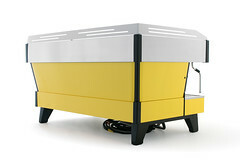 The machine was finished with brass-plated and polished accents. 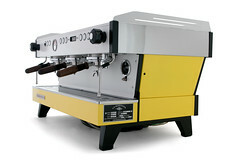 The Mazzer Robur E and Mazzer Super Jolly E was powder coated pastel green with a matte finish. The finishing touch is the Napa Technology WineStation (wine dispenser and preserver). Powder coated with an off-white matte finish. Meticulously detailed with hand painted gold crests by Forever Powder Coating. BBCM has all the elements of a high-class environment yet is equally as approachable as the place around the corner. We were excited to help bring their style to life with each piece of equipment. Next time you’re on the Sunset Strip in West Hollywood be sure to pull up a chair on the patio and enjoy the carefully curated experience at The BBCM Cafe. 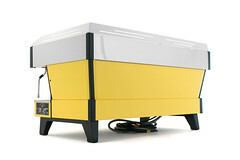 WANT YOUR OWN CUSTOM MACHINE? CONTACT US AT INFO@ESPRESSOPARTS.COM TO GET THE CONVERSATION GOING. OR MODIFY YOUR OWN WITH EP CUSTOM SHOP PARTS. Espresso Parts, LLC is a modest company with big ambitions. Masters of the specialty coffee universe, we are a dynamic team with the sole purpose of providing the best customer service experience, period! With a renewed commitment to the customer experience we do everything possible to build long lasting relationships while ensuring the highest quality product and best service! Without you, our amazing customers, we would not be able to do what we love everyday, and for that we are eternally grateful!